VirtNext scam found at virtnext.com tries to position itself as the only legitimate binary trading system, and it’s quite successful at it. If you found this VirtNext review, you’re currently reading one of the only few honest reviews out there. Read on as we uncover the truth about VirtNext scam in details. Is there really an automated trading software that doesn’t lose? 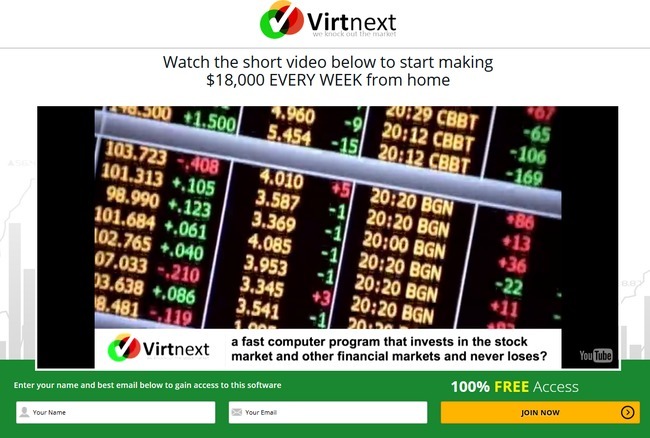 Just like any other binary trading software scams, VirtNext scam found at virtnext.com starts off their sales video with hypes and empty promises. VirtNext claims that their system has only lost once in the last 4 years, which is 1 loss out of 1,478 trading sessions. As if it doesn’t sound impressive enough, VirtNext also claims that their system is developed by Vincent Bollore, a real billionaire from France that commands a net worth of $6.2 billion at the time of writing. However, a thorough research on both VirtNext and Vincent Bollore proves that the billionaire has virtually no connection to VirtNext scam. In addition, we found no information about VirtNext Investments Ltd. at all after an extensive investigation. The only official information about the company is the sales page found at virtnext.com. There is no official company address, phone number, or any other contact information. How can anyone trust a company that exist only on a single sales page? A more alarming truth can be found in the publicly available whois information of VirtNext. It shows the information about a registered domain, in this case virtnext.com. At the time of this writing, it was found that VirtNext.com was only created a little more than 2 months ago, even though the sales video claims that the company has been trading for its members for the past 4 years. At this point, it’s obvious that VirtNext Investments Ltd. is a non-existent company, fabricated just to promote the binary trading software scam. Stay vigilant and don’t be fooled by VirtNext scam, as we have a disturbing truth to reveal in the later part of this review. Before we continue the review, we want to talk about binary trading to make sure everyone understand how it works. If you have experience with binary options, you may skip this segment. Binary trading is gaining popularity in recent years due to its simplicity in execution. With binary options, you don’t need to read financial news or analyze sophisticated market movements. You only need to predict if the price of an asset will rise or fall after a short period of time, usually between 30 seconds to minutes. There can only be 2 outcomes – either you are right, or you are wrong. There is no middle ground (hence the name binary, or 2 options). This is how it works – let’s say I feel that the price of oil market will rise 3 minutes from now, and I bet $50 on a 3-minutes contract. When the time is up and I’m correct, I win a certain percentage of what I bet, usually between 60% to 80% ($30 to $40). But if I’m wrong, I lose the entire $50 that I bet. In practice, binary trading is not that different from gambling. Much like guessing the outcome of a coin toss, there’s no way to accurately predict the outcome of binary options in such a short period of time. In most cases, traders rely solely on pure luck and gut feelings. Even if you manage a 50% win rate, you’ll still lose money due to the uneven winning vs losing payouts of binary options. The difference in payouts is how binary options brokers make big money off the traders, and it’s also why majority of binary options traders lose money. VirtNext scam claims that it uses extremely fast computers and existing infrastructure to buy and sell assets, currencies and futures in the financial market. It is supposed to trade in various stocks exchange across the world, but in fact the VirtNext software only operates in binary options markets. Not only that, having an extremely fast computer won’t help in binary options because there will always be a predetermined time to elapse before the individual contracts expire. Having a large number of positions doesn’t increase the chance of winning either, since every position opened is an independent speculation. Even if 10 positions are opened at the exact same time, the odds of winning each trade is no higher than 50%. VirtNext is just trying to confuse inexperience internet users who don’t have any previous knowledge with binary options with their FAQ. This is one of the scariest scams out there simply because there are so many biased reviews that try to trick you into buying the scam. The truth is, any affiliate who manages to sell the scam to someone will be paid $250 for his/her effort. I could’ve jumped on the bandwagon and written a bogus review to trick my readers and earn the fat commissions for myself. But I did not, because I’ve been a victim myself and I don’t want anyone else to fall into the binary software trap. The next time you come across online opportunities that seem too good to be true, try to think about it rationally. There’s no such thing as free lunch in the world. VirtNext is one of the more successful binary software scams out there because it has managed to generate a lot of fake reviews and misguide its potential victims. If you decide to sign up for VirtNext, you’ll have to register for a broker account through their sales page (which is an affiliate link). The scammers behind VirtNext scam will earn a sum of referral fees as soon as you make your first deposit. I was assigned to one of their affiliated brokers, Glenridge Capital. You need to deposit at least $250 with Glenridge before you can start trading. The minimum deposit for other affiliated brokers may be slightly different. Even if you already have an existing trading account with their affiliated broker, you have to register for a brand new account using a different email address. Why? Because the scammers behind VirtNext scam cannot earn their referral fees unless you sign up for a new account through their affiliate link. Not only that, VirtNext scam will continue to make money off you over the long term. 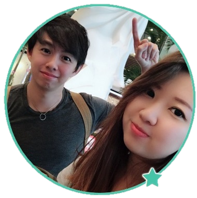 The team behind VirtNext will earn commission for every trade that their automated software makes for you. To make things worse, since VirtNext runs completely on autopilot, they can dictate your trading frequency and the trade amounts. In short, they can decide how much commissions to earn off you, as long as you still have money in your trading account. The scammers behind VirtNext will profit regardless of whether you make or lose money using their automated software. YES, VIRTNEXT IS A SCAM. As we’ve said in the review earlier, we don’t recommend binary options trading as a way to make money online, at all. It’s not that different from gambling, and using an automated trading software is no different. You are essentially putting your hopes and entire investment in a piece of software that gambles on your behalf. I have been investigating these scams after coming across Quantum Code. That one was actually very easy to identify as a scam – and as an added bonus, the video testimonials are absolutely hilariously bad – I teared-up laughing. This one seems more serious – there are some VERY credible sites out there that identify and condemn other Binary Options scams and push this hard as being a good, legitimate deal. I feel truly sorry for those who have lost their hard-earned money to these criminals. Bottom line though, no matter what the software, NO ONE knows what a share price will do in a few minutes – NO ONE. You would literally be better off at the casino playing slot machines – you’ll always lose, but your money will last longer! Hi Keith, thanks for dropping by. I’ve realize that there are some binary options authority sites pushing Virtnex as being a legitimate software. Unfortunately they are just looking for the handsome affiliate payout for new referrals. so over 80%?, you are kidding me. Thank you for sharing. I had similar experience with some other binary software scams. I stopped buying into the hypes after some painful learning experience. Take it as a lesson and move on. There are legitimate opportunities out there. No problem Nasir, I’m glad this review helped. I lost $500 with Ivvoryoption. Never again. Binary options is a scam.